Today I had to change the target namespace for an envelope schema to resolve a conflict that caused XML validation issues in the pipeline. 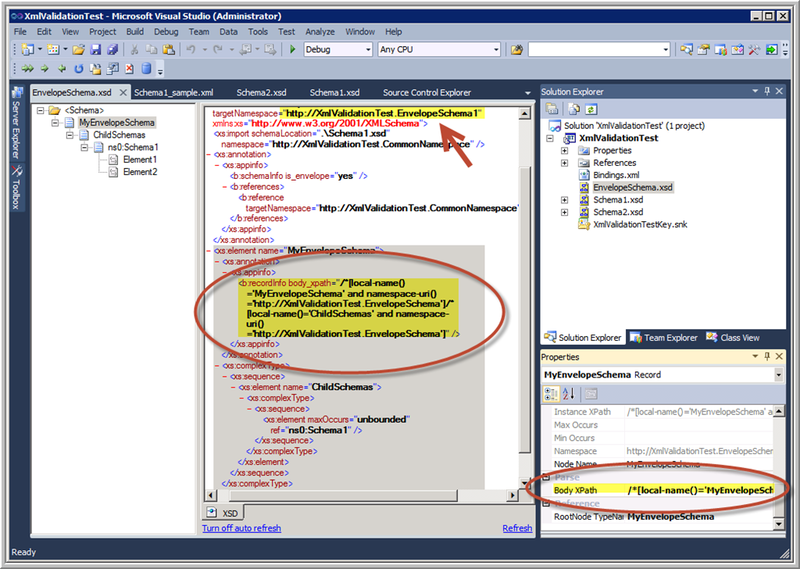 I also had a few other changes to make and for various reasons I did not use the BizTalk Schema Editor tool, but instead opened the schema in the standard Visual Studio XML(Text) Editor mode. After having dutifully made the change, tested all the maps, ensured the project compiled properly, and successfully run all the unit tests, I deployed the solution. There was a failure executing the receive pipeline: “Microsoft.BizTalk.DefaultPipelines.XMLReceive, Microsoft.BizTalk.DefaultPipelines, Version=3.0.1.0, Culture=neutral, PublicKeyToken=31bf3856ad364e35” Source: “XML disassembler” Receive Port: “XmlValidationReceivePort” URI: “C:\BizTalk\Folders\XML_VAL_IN\*.xml” Reason: This Disassembler cannot retrieve body nodes using this XPath: “/*[local-name()=’MyEnvelopeSchema’ and namespace-uri()=’http://XmlValidationTest.EnvelopeSchema’%5D/*%5Blocal-name()=’ChildSchemas&#8217; and namespace-uri()=’http://XmlValidationTest.EnvelopeSchema’%5D&#8221;. Only then did I realise that in updating the target namespace of the schema, I forgot to update the BodyXPath value – which of course has the namespace all through it! The good news is that when you use the Schema Editor to change the target namespace, this synchronisation is taken care of for you automatically. 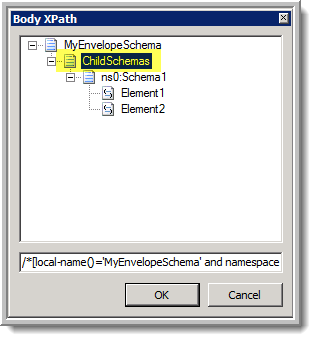 And if fact, you cannot change the BodyXPath property by typing in the property grid – you have to open the Body XPath dialog as shown above.